Brandeis professor, Anita Hill addressed graduates of Rutgers-Camden Law School at BB&T Pavilion in Camden, NJ. on Thursday, May 17, 2018. 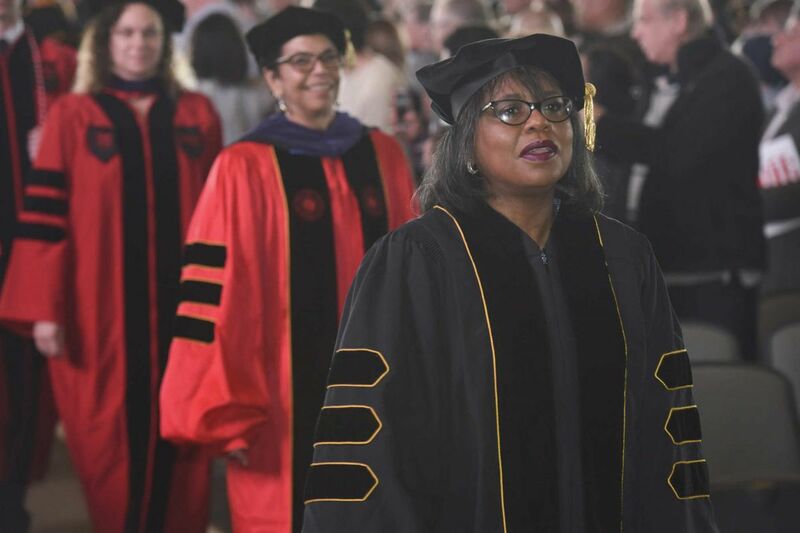 Anita Hill, long a symbol for standing up against sexual harassment, gave a rousing charge to law school graduates of Rutgers University-Camden on Thursday, urging them to work for social justice in whatever legal role they pursue and to "enshrine the ideals" put forth by important movements, including MeToo. "I believe that no one is better equipped to make those ideals a reality than you are as trained lawyers," said the Brandeis University law professor, famous for her 1991 accusations of sexual harassment against Clarence Thomas, then a U.S. Supreme Court nominee. In a nearly 25-minute address to more than 150 graduates and their families, Hill emphasized the importance of inclusion and equality and the need to bravely stand up for both. While barely mentioning her own Senate testimony against Thomas more than 25 years ago, she repeatedly referred to MeToo, the anti-sexual harassment and abuse movement that drew international acclaim last year after revelations that movie mogul Harvey Weinstein was accused of repeatedly abusing women. "We will never be the same after the MeToo movement, after such revelations of sexual violence," Hill told graduates, drawing applause and a standing ovation at the end of her speech. "We can never as a society ignore it and pretend it doesn't exist. We can't be the same as we were before, and we certainly can't go backward when we know that so many people are hurting and suffering." Rutgers-Camden chancellor Phoebe A. Haddon, also a lawyer, three months ago invited Hill to speak, impressed with her recent work, encouraging women to enter science, technology, engineering, and math fields but also because of the context of MeToo and the powerful men who have lost their jobs as more women have spoken out. The two women have known each other for decades, and Haddon was supportive of Hill when she stood up against sexual harassment at a time when many others did not. Hill's address comes at a time when more schools have turned to female commencement speakers this year, some of whom also have addressed MeToo. Hill is scheduled to give two other commencement addresses in the coming weeks. At the Rutgers-Camden ceremony, held at the BB&T Pavilion, Hill also received an honorary degree and a lengthy citation, praising her work. While largely serious, Hill also made light of the geese that started squawking in the grassy outdoor field behind the ceremony during a poignant moment in her speech when she asked people to think about those who were not able to graduate because of circumstances that prevented them from getting an education. Hill told graduates that her hero was Harriet Tubman, and said that if she had lived in Tubman's times, she would have worked on the Underground Railroad, served as a nurse in the Union army, and later fought for women's suffrage. Instead, she said she sought to embody Tubman's ideals in her life. "I could honor her by showing in my own time a sliver of the courage and the commitment to freedom that she showed in hers," Hill said. "I did my very best to do so in 1991 and I have continued to do so every day since." She asked the graduates to make a promise to her that they would work toward social justice, no matter the conditions the world is in. "Promise me, whether in times of certainty and clarity or in times of chaos," she said, "that you will be your bravest self, the bravest self you can be to confront the challenges of the world and to confront your own challenges."